Yesterday I ventured out to run errands in the afternoon. 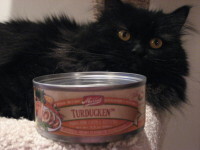 Cat food, bank, and clothes shopping. I am usually inspired to shop when I have an event coming up, like the meeting in Chicago coming up this week. (Yes, I finished the presentation materials and in a quite satisfactory manner, if I say so myself.) So, shopping I did go. I found a new top or two, which was my goal. Without too much detail, the changing room is not a favorite room of mine, increasingly so. I'm glad I've signed up for the Spring into Summer; my typical response to stressful events is to find comfort in food. Oh yeah, the scale reflects the comfort I've found lately, for sure, so this is a good time to pay more attention to being more fit. Continuing with the clothing shopping expedition.....I was also looking for new pajamas. I've noticed lately that several items of my nightwear would be better off in the rag box. I found none that were satisfactory yesterday. I did not think I was that picky---I would like a nice long t-shirt or a pretty cotton gown and I would be happy. There are plenty of t-shirts at Vicky's Secret but they would be a bit drafty. My torso must have lengthened in the past decade, right? *g* Other choices (at other shopping establishments) included pants with a short t-shirt (just not me) or some gowns that I would have to have a green mask plastered on my face to complete the look. /sigh Any suggestions for places to find satisfactory nightwear? In gardening news, the cats pointed out some catnip that is/was greening up. It is interesting that it is growing from between the bricks. I'm going to let it grow there, it adds character to the garden. There was some sampling (not by me)....just to make sure it was catnip, I'm sure. It is Saturday and I'm home from the week's travels. As usual, there is a pile of mail waiting and I'm noting the catalog surge has begun. However, one catalog was a bit of a surprise. 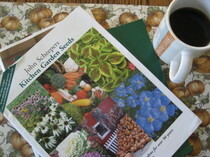 A seed catalog arrived this week.....about two months ahead of schedule! This is a new to me catalog but with the words kitchen garden in the title, it has the potential to warm my heart. I'll have to put this in a safe place to look at after the holidays. I haven't even put my current garden to bed yet! Now is not the time for planning the next one. Today, I will be pulling the old plants and putting away the tomato cages for next year. It will be a lovely day for it, too! At the beginning of the week, I made a decision to not connect to the Internet in the evenings in the hotel but to knit or read. I should find it no surprise that I can actually make good knitting progress if I am not reading blogs or surfing. I knit through almost two balls of the fuschia yarn when I finally took note of the little warning lights going off. 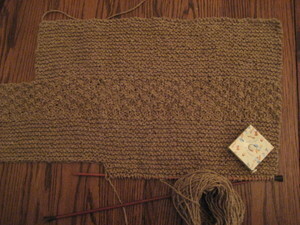 The (virtual) warning lights were blinking because this sweater project was spreading over my lap. Really spreading. So, I threaded through some waste yarn, slipped my work off the circular needle and proceeded into the hotel room bathroom to evaluate. Here are the evaluation results: 1) My gauge is off just a smidge. I had planned for a 49 inch circumference and I got 50 inches. Not so bad. 2) A 50 inch circumference is way too big for me, especially in a bulky yarn. I miscalculated the amount of ease I should add, obviously. 3) I like the fabric of the yarn. 4) I like the colors....but not next to my face. 5) I like knitting in the round. 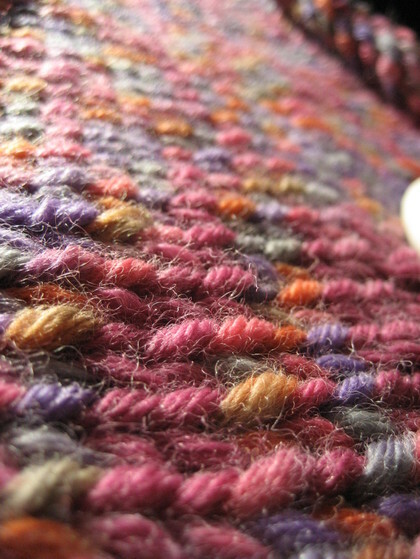 It is great mindless knitting, which is a real soother. 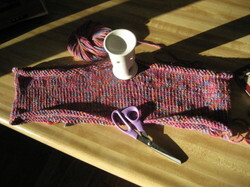 This project is going to transform from a fuschia sweater into a great fuschia felted bag. I plan on knitting an EZ raglan seamless sweater.....sometime. But, I'll use a lighter weight yarn, for sure. I'll concentrate my sweater knitting on Williamsro. Thursday night, I set aside my knitting and started to read a fantasy paperback, The Hallowed Hunt by Lois McMaster Bujold. I haven't read the earlier two books in the series and this one stands alone nicely. I enjoy this author's tales and this book is certainly holding my interest. Nice mind candy and good for my current feelling of being close to burn-out. The burn-out feeling refers to work, which (for good reasons you all know) won't be discussed in any detail here. However, it has been a busy year with a lot of responsibilities and next year looks the same in many respects. DH and I work on the same team, and he's under many of the same pressures that I am. In one way that is fortunate because we understand what the other is going through at work. On the other hand, it leaves two very tired/burned-out people in the same house with no one else to pick up the slack. We'll have an opportunity to recharge during the deer hunting season in about two weeks. We both hunt and sitting in a tree all day surrounded by nature can untie knots no massage therapist or glass of wine can touch. I may as well address hunting here briefly. I've hunted with my family since I've been a child. Frankly, I view it more like grocery shopping. I am a meat-eater and I think hunting is a very direct, and honest way of putting meat on the table. Enough said. Thanks for the well (ahem!) wishes regarding a dry basement. This morning was also a dry basement morning...we are having a real run of it! My stylist was pretty forgiving of my scissor activity but she did mention that the state makes her pay for permission to cut hair. No knitting accomplished yet today since I drove myself into work and back. Tomorrow my knitting time returns. Some progress was made on Sonnet this weekend. I'm certainly not a speedy knitter but, like the turtle, I make my way slowly but surely to the finish line. I am at the midpoint of the underarm of the right side. I'm pretty pleased with the texture of the fabric and it looks about the right size. As you may remember I modified the pattern so the neckline is more modest. At this point, I've used about 1.75 skeins of Rowan summer tweed - I purchased ten skeins in all. Looks like I better go looking for a few more skeins if I want long or even 3/4-length sleeves! Crazy Aunt Purl wrote recently about body image and dieting--or rather not dieting but eating with an intent to be healthy. She touched on a topic where a lot of blog readers live --- she had 362 or so comments just for the first post on the topic. I have to say I live there, too. The photo of me knitting in the airport really surprised me. Do I really look like that??! That image doesn't match my internal image of myself at all. Nope, not at all. My internal image is not quite so, um, triangle-shaped! There's no quick fix for the woman in that photo or the woman reflected in my brain's mirror, sigh. I am thankful for Runagogo (or Walkagogo, in my case) and for blogging that made me connect with my inner --or should that be my outer-- self-image. That photo is still in the front of my mind when I'm making food choices. The map of heart disease from the February 2007 issue of National Geographic also made a huge impression on me. Yeah, I live in Wisconsin, which had lower than average deaths between 1999 and 2003 but, for some reason, that map has been influencing my food choices to some degree. I think I'm going to print it out and stick it under a refrigerator magnet. Here's a little doo-dad measuring tape I've been keeping with my Sonnet project. I love that it has an automatic retracto-button and can you see the little spool at the end of the tape?! Very cool little crafty gadget.